Here I go again with more book reviews. Maybe I should write more about daily life, but when I’m posting stuff fairly often on Facebook, I lose the drive to do it all again here. Book reviews are another thing. I love to have a record of what I’ve read and this is a great way for me to look back… it may even be interesting to other people who love books like I do – so, with that said, on to my first review for this blog post…. 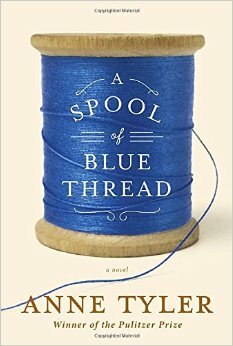 A Spool of Blue Thread by Anne Tyler. Strange book, this. I’ve read quite a few of Anne Tyler’s books, and looking back, I can say they are hit or miss for me. This one was unfortunately a miss. There was once a great TV show about “nothing” called Seinfeld. Well, this book was essentially about “nothing” and while it kept my attention for the most part, I really cannot recommend it. Yes, it was very well written, but the content… everyday life of an everyday family – IMHO it was just not novel-worthy. Sorry Anne Tyler. I wanted to scream in frustration when, towards the end of the book where it SHOULD BE wrapping up, she starts the whole mostly boring story AGAIN from a different person’s point of view. I had to skip over that. No way was I reading all that again, even from a different perspective. I waited weeks to get this from the library and then, when life got in the way and I didn’t finish it in time, I had to return it and re-request it. Honestly, it was not worth all that effort. Maybe I should have perused some reviews BEFORE I was so darn-tootin’ I was going to read it… but I wanted to form my own opinions, and that I have done. And they are not good. The Nightingale by Kristin Hannah. 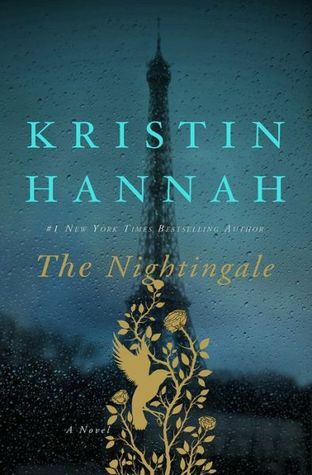 Prior to this book, I had never read anything by Kristin Hannah. Yes, I’ve seen her works here and there, and yes I had definitely heard of her. I was of the opinion that all of her stuff would fall into the category of silly fluffy romance, and I have no time for that genre` these days. Then I started hearing a lot of kerfuffle about this book being so fabulous…. and since it was set in my favorite era (WWII), I decided to find out for myself what all the brouhaha was about. I am SO GLAD I DID!! Let me preface this by saying that at the beginning of the book I nearly quit reading! It starts out in Paris, 1939. The dialog between the two main characters (sisters) at the beginning of this book sounded to me like two sisters talking to/harassing each other in the language of today. I didn’t get the 1939 vibe whatsoever. I was so ticked off, as I’d had high hopes for this book….. this time I’d read some reviews and they sounded great. I began to think… oh the minions who wrote the reviews are probably all big fans of Hannah’s fluffy romance style, and will say anything good about her novels. Au contraire mon frere! This book was simply EXCELLENT! Not silly, not fluffy, but instead what I believe to be very realistic descriptions of what went on in occupied France during WWII. If you are a fan of this era, I can guarantee, yes guarantee you won’t regret reading this one. It’s good, it’s really good. This entry was posted in Books 2015 and tagged WWII novels. Bookmark the permalink. Ive bought this book on a recommendation in my FB book group………….haven’t read it yet but now I am enthused!